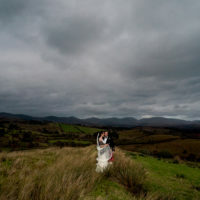 A slideshow from Caroline and Denis wedding day in the beautiful Harvey’s Point hotel on the shores of Lough Eske. Caroline and the girls got ready in her home house, just a stones throw away from the hotel where Denis and the boys got ready. The couple were having their ceremony in the hotel, hoping to have it outside on the pier but the weather conditions gave them no choice but to have it inside. A typical Donegal’s summers day. The humanist ceremony was held the garden suite with Willie Collins officiating the marriage. After the bride and groom said their vows, exchanged rings and met their friends and family we got some photos done in between then showers. When the meal and speeches were finished it was then onto Late Nite Radio band to entertain the guest fro the rest of the night.